2 Disc Set -- The latest Mitsuru Okabe production was taped in October 2003 around the Olympia Weekend. 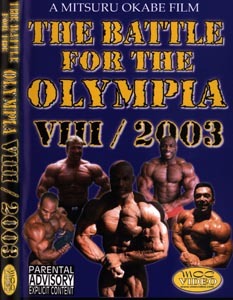 Footage includes: Melvin Anthony (back); Ronnie Coleman; Troy Alves (back); Dennis James; Dexter Jackson (shoulders, arms); Gunter Schlierkamp; Claude Groulx (arms, chest, shoulders); Olympia Backstage (judging, expo, show); Darrem Charles (arms); Art Atwood (back, biceps); Jay Cutler (chest, biceps); Rodney St. Cloud (chest); Jonathan Davie (chest, arms, legs). A Mitsuru Okabe Film; Running time: 339; DVD-Video NTSC; All Regions; DVD Release Date: October 2004.